The idea that the U.S. can stand still as China rises is misplaced. Washington needs to show it can scramble. Arguing against the declinist mood in U.S. politics these days, Robert Kagan, in “Not fade away: Against the myth of American decline,” recalls the triumph of the Cold War as a confidence-booster for worried Americans. The challenges confronting the United States today, Kagan contends, “are not greater than the challenges the United States faced during the Cold War,” when Washington worked to contain Soviet expansion by cultivating ties with war-depleted countries in the Soviet Union’s neighborhood. Today, having established strategic alliances with several of China’s neighbors, the United States is in a more favorable position than China, whose emergence as a rising power started from a “relatively weak” base. According to Kagan, Beijing faces considerable limits due to its geostrategic location, and it’s China’s turn to scramble, while the United States needs only to “stand still,” to “hold on to what it has” and secure its position. If the United States was able to succeed in the Cold War, the argument goes, conditions would appear to favor the U.S. now, as well. There’s some merit in this, but also grounds for skepticism over the idea that the United States can afford to stand still in the face of China’s increasing competition and influence. Indeed, China’s scramble today in some ways bears a striking resemblance to the U.S. scramble half a century ago, suggesting a bumpy road ahead for any nation that Beijing deems to be standing in its way. The foundation of U.S. success in the Cold War was its ability to translate economic growth into military capabilities and “soft power” capacity, something the Soviet Union failed to do because of the underlying weaknesses in its economy and overinvestment in the military. In contrast, for all the unease created by rapid increases in China’s military spending, the Chinese defense budget has been kept at a far more sustainable level than that of the Soviet Union. It’s also worth recalling that back in the 1980s, increased investment in the country’s military complex forced the Soviets to halt the production of some other civilian goods. The Chinese defense budget isn’t proving such a drain on resources, and isn’t shackling the economy the way Soviet efforts did. Indeed, while the Soviet economy lagged in comparison with the United States, China’s has been projected to surpass the U.S. in terms of GDP by 2025, by some estimates. As a result, China has the luxury that the United States once had, namely of being able to throw a little money around to try to build support in its neighborhood. The fact that China is currently surrounded by a web of U.S. alliances in East Asia and the Pacific may seem comforting for the United States, but there are a number of caveats. For a start, many of the closest U.S. allies in the region are also enmeshed in a web of interdependence with China, which explains their reluctance to upset Beijing. But there’s another interesting point that is sometimes overlooked amidst the understandable attention paid to China’s moves in East Asia. Just as the United States worked hard to develop alliance and influence in Cold War Europe, the Middle East and East Asia, China has been investing economic and political capital in courting Latin America, engaging Europe, expanding its presence in the Middle East and buying off Africa. China, then, may find ways to jump any diplomatic fence erected around it. But there’s another parallel that should trouble the United States. Ultimately, what brought about the Soviet collapse was a combination of domestic policy failures, which long undermined the country before over exertion on foreign soil exhausted Soviet energy, pushing it into a downward spiral. And the United States today could find itself on its own downward spiral, as it confronts a troubled economy marked by huge deficits and a divided political system that has at times ceased to function. Of course, the Soviet Union problem was exacerbated by a centralized model that contrasts with the U.S. liberal democratic system. But the outcome will remain the same: the accumulation of power by one nation, to the detriment of a distracted and declining force. The good news for the United States is that China’s attempt to sell its image abroad and wield its own soft power has met with limited success. The U.S. model still holds more sway, from Europe to much of East Asia and in between. But to retain this dominance, the U.S. must press home its advantages. U.S. global influence can be fostered only if the U.S. system itself is able to function and deliver on promises that other systems can’t. This shouldn’t mean the United States turning inward and retreating from global commitments. Rather, the United States needs to be able to showcase its resilience – at home and abroad – if it is to continue to maintain its appeal. This will mean Washington demonstrating that it is both able and willing to defend global assets, and that it will stand by values that it supposedly holds dear – including an open global trading system, free and fair access to the global commons, and respect for the rule of law. By reaffirming its commitment to Asia in recent months, Washington is shifting the focus of international attention back to China’s backyard, compelling China to reassess its ambitions in its neighborhood. But this strategy will only succeed if the Obama administration and its successors can prove that such reengagement is serious and durable, and that it is more about substance than public announcements. 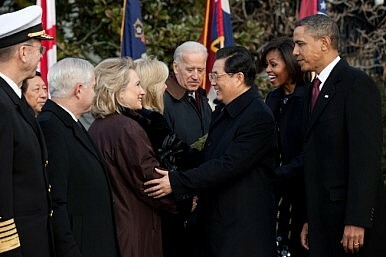 All this means that the United States must respond to China’s scramble with its own scramble, both at home and abroad. Standing still just isn’t an option. Le Thuy Trang is a researcher at the Foreign Policy and Strategic Studies, Diplomatic Academy of Vietnam. Talk of a U.S. pivot toward the Asia-Pacific is being replaced with the idea of a rebalancing. Regardless, U.S. military strategy is taking on an interesting shape.